A concert featuring American Grammy-winning artist Bruno Mars was forced to be temporarily halted in July, when on-stage pyrotechnics apparently caused a lighting rig to catch fire. Here, SHP has some guidelines for the safe use of pyrotechnics at events. Mars was just minutes into his Glasgow Green show when a stray firework reportedly hit the light and set it ablaze. The fire was quickly brought under control, allowing Mars to return and complete his set. A report on Barbour by Association of British Theatre Technicians (ABTT) provides some guidance on the safe use of pyrotechnics at concert and theatre venues. Risk Assessments must be completed under Regulation 3 of the Management of Health & Safety at Work Regulations and current fire safety legislation. Pyrotechnics much only be used by competent adults aged over 18 years. The report goes on to talk about the importance of planning in relation to then use of pyrotechnics. It asks, what are they trying to achieve and how appropriate are they to the venue or location? A suitable emergency plan must also be discussed and documented with the venue to their approval. People – including working at height when setting up, the proximity of the effects to staff, the public and security and warnings to artists. Venue – Air draughts that could blow sparks, flames and smoke in an unfavourable direction. The report also goes into detail about the safe procurement and storage of explosives. 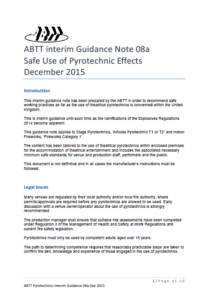 For more information on Barbour, click here, or fill in the form on the right to download the ABTT Safe Use of Pyrotechnic Effects Guidance Report. On-stage pyrotechnics safety guidelines A concert featuring American Grammy-winning artist Bruno Mars was forced to be temporarily halted in July, when on-stage pyrotechnics apparently caused a lighting rig to catch fire. Here, SHP has some guidelines for the safe use of pyrotechnics at events.